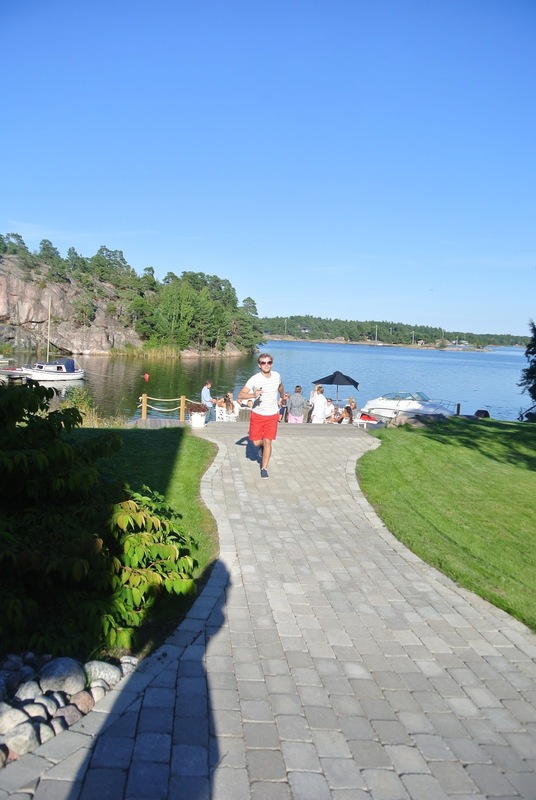 Like I said the other day, I headed out to my friend Filip's summerhouse in the middle of last week with him and Gustav. We've been goign to his summerhouse semi-regularly for 4 years and its always the best when we do. Now that we are suuuuper grown up, some of us *coughnotmecough* have driver's licenses, and so Filip drove us out there. Such a luxury that makes me laugh at those little 17 year olds shlepping through the train station, excited to get drunk of our parent's alcohol on the countryside. There are LOTS of preparations to be made...like cutting the grass. Now, I'm going to be honest and say I was never even asked to do it, but Gustav was, and he so handsomely agreed. Filip and Andre (who had come to help in the preperations the night before) drove off to get the last of it all and so house prep was left to us! It was about 14:00 at this point and guests were supposed to arrive after 16, so I thought we had time...which we didn't because 10 minutes later Filip calls and says "some people are already on their way and will arrive in 30 minutes" ... WHAT?! 24 teenagers (can I still call them that though half are 20 and "technically adults" now?) managed to organise themselves and come to a party an hour away from town, I was impressed and so so happy! So, we had a bit of summer sangria on the porch and caught up on life. The great thing about the year coming after high school graduation is that people are literally EVERYWHERE. Plans, places and experiences are spread out all over the world and it was really nice hearing what everyone had gotten up to since I last same them - some I hadn't seen since graduation! There was the "silly pic" which didn't exactly work, nice bunny ears there, Alex. And after finishing off that tub of sangria we headed over to the front of the house to sit down for dinner. 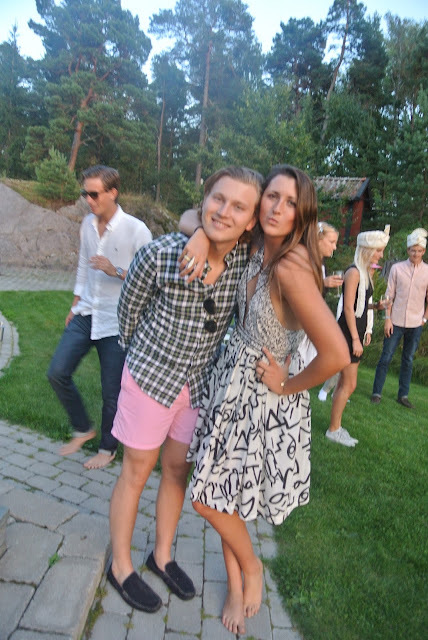 Crayfish parties are like a cult here, and they are so swedish that you just can't avoid it if you live here. And, why would you? They're the best! Basically, you eat crayfish. And drink schnapps for hours. And you sing as well, that too! 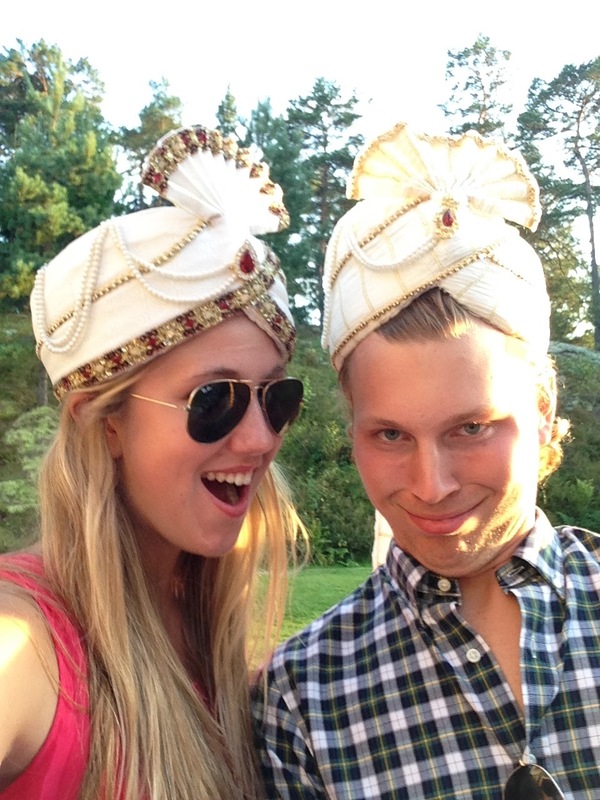 the MOST swedish phrase there is, is "vad tur vi har med vädret!" or basically "we are so lucky with this weather!" 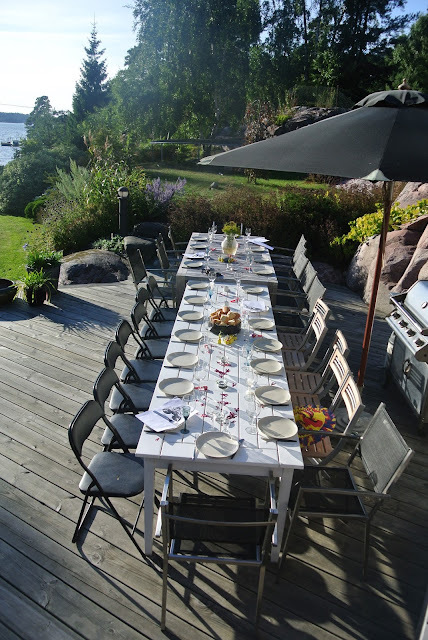 If its sunny on midsummer or at a crayfish party you will no doubt hear this sentence a bagillion times, because Swede's are very into their weather. The reason for this phrase, in my opinion is because if there is good weather the only thing to say is that we're lucky. It probably wasn't supposed to be, but it was and there is no reason for it, not that its August and summer usually means sun. No no, for Swede's the only thing that makes sense, is rain and cold. So if it was raining at this party, you'd probably hear "Well I mean it is late-August, the summer is almost over! What could you expect?" Or "yeah, I saw on the news it was supposed to rain all week" blah blah blah its no surprise and people don't really care that much, you'll probably hear "ach, its supposed to rain at your crayfish party! That just goes with it"
But anyways, weren't we lucky with the weather? I mean come on! 25 degrees 28th of August? Insane! So we dissected those poor cooked crayfish, ate cheese pie, and drank and sang. So besides "schnapps visor" (tunes) a typical alcohol song at parties is "Lambo". It's basically an excuse to down your whole drink quickly without feeling bad about it because people are singing about you doing it. The people at the table sing about how you should down the glass because your a drunk dog and while they do that, you down. When you're done? You get to do your own little solo and say that "yes I have had it all and to prove it I'm going to tip the glass on the wrong side on my head" ...it rhymes in Swedish and is a bit more clever so just go with it. After sitting for too long we jumped up and took some pictures before the sun set! I can't really remember what we were laughing at, probably one of those hilarious jokes I know. This photo sequence is cute, malls! Love these guys, and with this sequence you can tell why my photos are going towards their finish...too messy. That's a pretty good photo to end it on don't you think? Thank you Filip for this amazing Party!